Who Wants a Mariuca CNY Mug? So Happy Chinese New Year once again to all my readers and now, feast your eyes on this awesome, red hot Mariuca CNY Mug. I love the red highlights in Mariuca's hair and check out the lovely cheongsam I'm wearing! If previously the Mariuca Halloween Mug was my personal favourite, this Mariuca CNY Mug has now taken precedence; I absolutely LOVE this mug and red happens to be my favourite colour too! For this contest, I'd like to ask my readers and friends to do a very simple task. To be in the running for this Mariuca CNY Mug, all you have to do is tell me what you love most about Mariuca. You can send in as many entries as you wish and the person with the best entry will win this lucky Mariuca CNY Mug! I can't wait to see who will be enjoying this beautiful, shiny red mug so let's proceed to the rules below. 1. Leave a comment on this post with your entry. 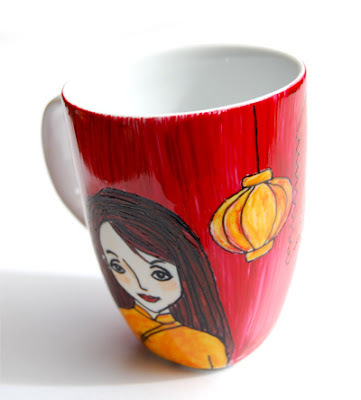 The person with the best entry on what they love most about Mariuca wins this adorable Mariuca CNY Mug! 2. Contest starts on Feb 23, 2008 – March 23, 2008. 3. Winner will be announced here on March 30, 2008. Wah! 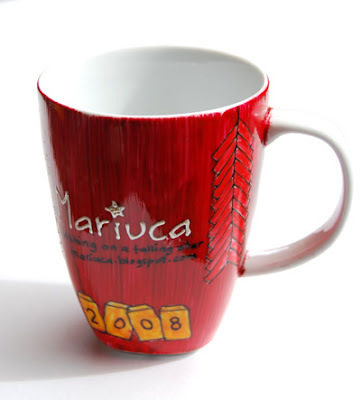 Another fabulous Mariuca mug... vava voom red some more :) I just wanna say you're fab person with a big heart. Gong Xi! Gong Xi! Whoa cool, a new contest. I already won one and missed the rest from you so this time I'm going to be sure to REMEMBER to participate! LOL! A new contest already?! This is the coolest mug yet, it looks awesomely red!!! I don't know if I should enter because I won one, should I Marzie? GP, i totally love the mug too...i love the colour and this is a great context! bravo for such a creative contest! wow! the mug your giving is really cute. i like items that are carefully handcrafted. beautiful! always waiting for you to give away that wonderful cup. hope this time i may be a winner!!!!!!!!!!!! If I said I wanted to win the mug for my best buddy cos the poor boy never won anything from you before, would that make my chances brighter? LOL! Yay! So many friends joining the contest! hope i get a chance to win the cup this time atleast! hahaha Trin.. have not been lucky here Trin... maybe this year would be my lucky year...lolzzz.. sure is a nice mug to win...ahem ahem!! Oh yeah babeh.. will submit mine before the due date for sure.. March 23rd right?? Wah seriously? More than one entry allowed?? Awesome...thanks GP! You're so generous and kind!! Muahssss! hahaha.. sorry ah.. tak perasaan..ok.. thanks. will get my entry in soonest!! Muahsss! I always visit her blog but I seldom leave her the comment. I only leave comment on the post I feel like interested on it. I just try to update my blog ...share what happening in my life ...blah blah blah! I thought people forget me already because I seldom visit their blog, din leave a regularly comment in their new post ...they must be forgetten meeeee! But this girl, Mariuca, still receive alot of readership from her readers, does not forget me! Still leave msg during my bday and other post. Marzie, can I ask you something? How you manage your bloghopping a day and yet still get many readers' comment? Are you sure you visit every of their blog in a day? Jamy!!! Yay, thanks so much for joining this contest too, love u la! I know your Blog through Emila's Blog. What a fun thing to participate in a giveaway contest in the blogosfer. Beside having a new friend, also we can express what we think about something (the object as the gift in a giveaway contest). I love your mug! Why? You have the same favorite color like me: one of them is red and other colors those can match each other and so brighten. Your name will be a very great memory for the winner as your mug comes from and made from. The drawing of a girl face is a representative of you as the hosting and a creator of that sweet mug. So everytime the winner sees that mug, she/he will always remember you!!!! I hope my honesty comment will steal your heart to consider me as the winner nominator. Hope I did not missed the train. It's Great to find this post. So how could i miss the chance to winning This beautiful Mug. I like This Mug Because I always like Girl in your Banner. Banner is so lively created And I have read how this banner is created. So In this Blog I love your banner. Let me wish on a falling star!! GP here is my entry...it's the tv sitcom Cheers theme because your blog reminds me of that happy bar in Boston and makes me fell the same way! Wah, GK came up with a nice modification of cheers' song! So cool! Yeah I love it Emila.. so creative lah he! !